A pair of shiny chrome and emerald-green Bakelite bookends flank half a dozen volumes with Art Deco bindings and such evocative titles as The Savoy Cocktail Book, The Metropolis of Tomorrow, The New York Book of Smart Interiors. What better way to show off a small collection of old books than between supports of the same period? How dull today's flat metal supports - a clear victory of function over aesthetics - seem in comparison with the Art Nouveau women, tresses aswiri, in brass and pewter; the Arts and Crafts hammered-copper designs; the ceramic figures by American art potters; or the miniaturized architectonics of geometric Art Deco forms. These and many other styles are showing up today at auctions, antique shows and in shops. They began to be produced in quantity at about the beginning of the 20th century, perhaps as a response to increased reading, and remained popular household accessories through the 1940s. Those who did not possess enough volumes to fill a glass-fronted bookcase could enclose their little library between a pair or two of bookends, which would keep a row of books upright on a shelf or tabletop, as well as provide easier retrieval of the books. 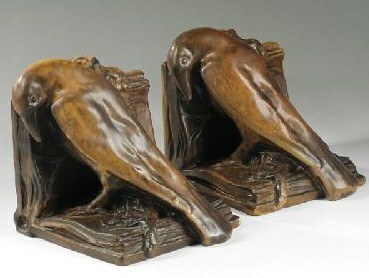 Finely crafted examples of early bookends can be found, on the average, for as little as 30 dollars. Some fetch as high as several hundred or even thousands of dollars if they are of known provenance or markedly of a style, such as Art Nouveau, Arts and Crafts, and Art Deco, for example. Bookends are available in a variety of media as well: metal, glass or crystal, pottery, and, in some cases, wood, marble or alabaster. Metal bookends are the most plentiful in today's market. They were made by the thousands by such American companies as the Roman Bronze Works in Brooklyn, New York, Gorham Manufacturing Company in Providence, Rhode Island, and Bradley & Hubbard in Meriden, Connecticut. Some of the most attractive are of beaten or hammered metal, primarily copper, pewter or brass. 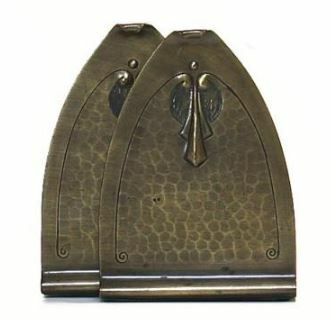 A good many embossed hammered-copper bookends were produced by the Roycroft Shops in East Aurora, New York, the crafts enterprise founded by Elbert Hubbard in 1895. For a number of years, the copper shop was under the direction of Viennese designer Karl Kipp. 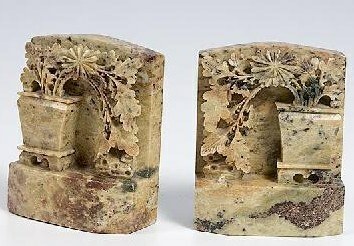 These bookends ("felt-covered bottoms - will never make a scratch," read the ads in a 1919 catalog) were made in a variety of shapes, adorned with simple flower or geometric motifs. Today they sell for an average of about $100 to $400. Metal book racks from earlier in the century are also available today. Seen at an antiques show recently was an Art Nouveau design: gilt brass bookends adorned with Alphonse Mucha-like faces were fastened to rods on which the books could stand. These sell for approx. $100. Another Art Nouveau rack, this one expandable and made of brass-plated cast iron, are selling for $200 – $500, depending on design and condition. One popular metal rack style consisted of a pair of metal spirals, or springs, attached to a wood or metal base. This spring-type design is rather like a pair of bookends from the thirties designed by Russel Wright, who was at the forefront of the American "Art Moderne" scene. The Wright bookends consisted of asymmetrical ribbons of metal, which curled to form elaborate letter S's. They are hard to come by today, but worth the search. Heavy glass or crystal bookends of Art Nouveau and Art Deco design can be exquisite, but difficult to find. Viewed by many as sculpture, they may sell singly - which in fact is not unusual for outstandingly crafted bookends of any period. At a Christie's auction in New York, a pair of frosted-glass female nudes with flowing hair carried an estimated value of $600 to $800. These particular bookends had been produced for a Parisian dealer named Etling who sold glass objects made in the Lalique vein. Incidentally, Lalique bookends do exist; when they can be found they generally sell at the high end of three figures. 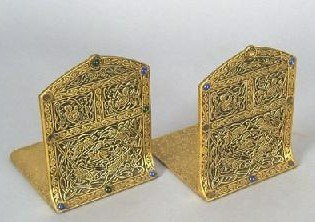 Bookends were also produced in the several Nancy, France, glassworks. An attractive pair of turquoise pate-de-verre bookends in the shape of stylized, grotesque fish sold for just over $2,000 at Sotheby's in London recently. The pair were made by Almeric Walter, a former Daum designer who opened his own shop in Nancy in 1919. Glass bookends by American manufacturers can also be found. Fostoria, Cambridge and Heisey – all located in Ohio - and Steuben in New York are just some of the makers. Prices on these items are generally lower than for those of European make: Fostoria bookends may cost $100 to $150, while an exquisite pair of crystal pouter pigeons by Cambridge Glass were seen selling for $350. Found at shops and shows - and seen in gallery and museum exhibitions as well - are bookends fashioned by American art pottery firms. These ceramic bookends are handsomely crafted objects that sometimes command respectable prices. The buyer may come upon pairs of pine cones, clematis or snowberry bookends for $250 from Roseville, one of the Zanesville, Ohio, potteries. But the average price for art-pottery bookends is over $200. For instance, a pair of 1921, dark green, glazed Buddhas by Rookwood (of Cincinnati, Ohio) may well fetch over $300. Ceramic owls by Van Briggle Pottery of Colorado (Artus Van Briggle was once a designer with Rookwood) have been seen for $200 upwards. 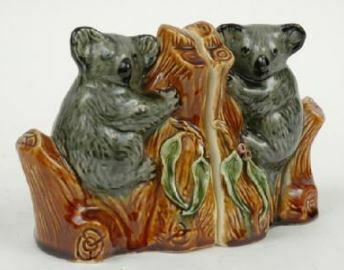 Fulper pottery also made fabulous Arts & Crafts ceramic bookends, which are highly desirable. A pair of glazed peacocks were selling for $750; bookends with the figure of the pharaoh Ramses II holding a book – a rare and sought-after design - were priced at $1,250. A single mat green eagle was tagged at $850. Bookend production at this New Jersey pottery reached its peak ca 1910 – 1920s. 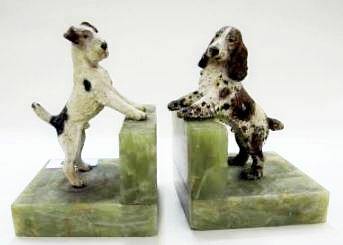 Later ceramic bookends, especially European Art Deco figures, generally sell for prices comparable to those of the finest American art potters. A pair of stylish, kneeling women, designed by Benno Geiger for the Austrian firm of Goldscheider, sold for $650 at a Sotheby's recently. Robj porcelain bookends - Robj was a Parisian dealer - portray everything from Harlequins and dancers to Indian chiefs and fish, all artfully molded. The Robj figures were highly popular in the thirties. Figural bookends - Russian wolfhounds, elephants, even Charles Lindbergh - sell well. Another category of figural bookends that are particularly desirable are those that are very American. For example, "Roman Bronze Works' buffalo, Indians and the like do quite well, going for $600 to $1,000. Pairs similar to this maker's - although perhaps not as finely cast - can be found for well under $300. There is also interest in bronze figural bookends that are matching rather than identical, such as a striking Dante and Beatrice by the Pompeian Bronze Works of New York. Often, these matching bookends are of higher quality since it is double the work because there are two figures cast. One Florida collector who has ten or so matched pairs in bronze doesn't use the figures as bookends at all. "I display them as pieces of sculpture," he said.